Strawberries & Heart Health: The major cause of heart disease and blood vessel damage is inflammation and oxidation of LDL. In order to protect the heart and blood vessels we need antioxidants and anti-inflammatory nutrients, which is what strawberries are packed with! The total antioxidant capacity of strawberries is 40 times greater than that of cereals, 10 times greater than vegetables, and 4 times greater than other fruits! Strawberries are also a source of other phytochemicals which help reduce risk of heart diseases because of their anti-inflammatory properties. Strawberry is also a good source of magnesium. This mineral is a cofactor for the antioxidant activity of the enzyme superoxide dismutase. Strawberry’s claim to fame as heart-healthy food is due to its high antioxidant nutrient content. Strawberries & Immunity: Strawberries are excellent sources of vitamin C. A serving of around 8 to 10 medium strawberries provides Vitamin C of about 88mg which is more than 200% of the RDA! Vitamin C is a well known immunity booster and a powerful antioxidant. So one cup of strawberries 2 to 3 times a week can help you keep away from the usual common colds during winter. Strawberries & Cancer: Strawberries are especially in focus for phytonutrients , primarily anthocyanins and ellagitannins. Strawberries are good sources of ellagic acid (as ellagitannins) which are naturally occurring antimutagens and anticarcinogens. Anthocyanins are powerful antioxidants which help to scavenge and neutralize the potentially negative effect of cancer-causing free radicals. Anti-cancer properties from strawberries are best reported in the case of breast, cervical, colon, and esophageal cancer. Strawberries & Blood Sugar: These low GI fruits provide only about 46 calories in one cup serving (8 to10 strawberries) and so are safe for diabetics. 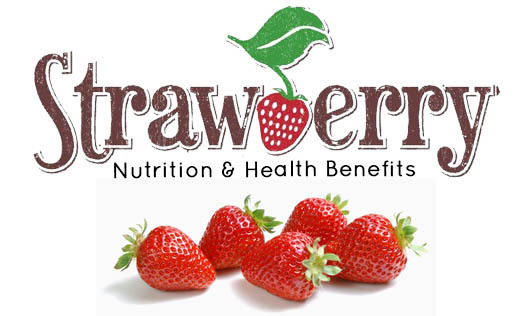 Research has shown that intake of strawberries may help to regulate blood sugar levels. This effect may be because of the presence of ellagitannins in strawberries which inhibit the activity of the enzyme which converts starch into sugar and thus helps to lower glucose absorption. Apart from these established benefits of strawberries, they make great choices for in-between meals as they are low in sugar, sodium, fat, and calories but high on nutrients and of course taste! Remember it is best to enjoy the strawberries fresh and not cooked for garnering maximum benefit.